"The Once and Future Flash"
This week on what used to be the fun CW DC show, Barry Allen travels into the future in order to solve the mystery of Savitar. Fun fact: I almost wrote “the mystery of Zoom” in that previous sentence because, if you guys haven’t realized it yet, this is the exact same plot as the Zoom plot from last season. Speedster villain + mysterious identity = snooore. And you know what makes all of that worse? When the show wastes my time with inconsequential storylines occurring IN THE FUTURE that don’t answer any questions, provide little in the way of potential fixes, and just serve to stretch the incredibly thin plot out even further. Hey, imagine someone sitting down next to you and starting a conversation with the words “I had the weirdest dream last night!” then proceeding to describe their dream for a solid hour and you want to scream at them because no one cares, dream stories are pointless, they aren’t real and mean nothing and affect nothing and shut up about your dreams! Yeah, that was this episode. WE NEED TO GO BACK TO THE FUTURE, MARTY — I MEAN, BARRY! I really hope the writers of The Flash are done with the time travel stuff after this season because it’s getting to be an exhausting plot point. They aren’t even really making things complicated anymore, it’s just a constant story well they keep drawing from because what else are they going to do with a hero who can run really fast? Personally, I have my fingers crossed that next season hinges on Barry’s ability to throw self-generated lightning or phase through solid objects instead of this time travel stuff. We’re dealing with this season, though, and this season is all about figuring out the identity of Savitar so that Barry can save Iris. Barry’s genius plan for figuring out Savitar’s identity this week is to travel into the future and ask someone who probably knows it, which I guess is a pretty solid plan. Better than most of what Barry does with his time travel, anyway. And it’s hard for him to retroactively erase a friend's baby when he moves forward in time, so that’s good. Barry ends up eight years in the future, where there is no Flash and metahuman villains have made Central City their playground. He gets accosted by Top (still a terrible villain name) and Mirror Master (not much better, but at least it’s alliterative) but manages to flee before they can beat him up too much. They’re what passes for villains of the week for this episode. After Barry manages to get away from Top and Mirror Master, he runs to a ruined future version of his and Iris’s apartment. Wow, no one snatched that quality real estate up while Barry was in deep, deep mourning? That’s actually the least believable thing about this episode. While he’s there, Cisco shows up — and how did Cisco know Barry would be there? Or that Barry was the Barry of 2017? He just had a feeling! Yeah, the writers don’t even try to pass this huge coincidence off as part of Cisco’s Vibe powers or anything, they just decide that Cisco had a hunch about his time-traveling BFF and we’re just gonna go with it. Sure, fine, that’s cool. Keep it coming, “The Once and Future Flash”. 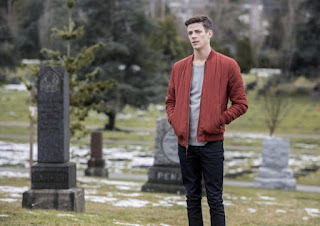 Listen, I know that I’m supposed to be very moved by Future Barry’s heartbroken self-isolation and, somewhere inside my soul, I am — but honestly, that hair? He doesn’t look sad and neglectful of his appearance, he looks like he time traveled back to a Hot Topic circa 2008 and he’s one studded bracelet away from being literally every kid who wrote “deep” poetry in middle school. This Barry spends fifteen minutes every morning making sure his bangs cover just the right amount of angsty face, then hairsprays that mess into a state of shiny, coiffed perfection that not even super speed could disrupt. Then, I assume, he writes in his diary. Anyway, Future Barry can’t tell Present Barry who Savitar is because Future Barry never found out. This is the section of the script where the writers should have gone, “Hey, maybe if Barry can’t get answers from this trip we should just scrap it?” but they didn’t, so I have to continue finding different ways to explain how we learn nothing, Barry learns nothing, and all of this is pointless. Like, yeah — Iris dying will make Barry sad, you guys! And Iris dying will make Joe sad! And Caitlin becoming Killer Frost is a bad thing! We really needed this trip into the future to uncover all those incredible truths. 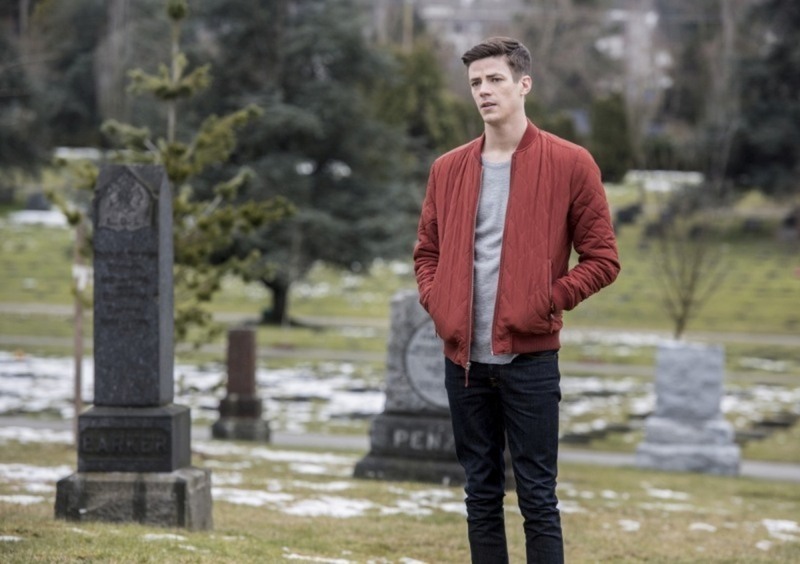 Barry bounces around to different future versions of people he knows, from Caitlin as Killer Frost to a catatonic Wally to a heavily grieving Joe West, but no one can (or wants to) tell him who Savitar is. Since this lack of information makes the trip to the future pointless, Barry decides to leave. It’s like Barry took a trip to the grocery store on only to figure out that it’s closed for a holiday he’s forgotten about, so he has to make the sad, empty-handed trudge back home. Except that his grocery list in this scenario is information on saving his future-dead fiancée. After Barry attempts to run back to his proper timeline and fails, he assumes that Top and Mirror Master had something to do with it. But it wasn't them — it was Cisco! Future Cisco, by the way, is the best thing about this episode that isn't Future Barry's stupid hair. The manic loneliness that he projects is at least interesting and played very well by Carlos Valdes. Also, the reveal that Cisco's hands had been frozen away by Killer Frost and replaced by ROBOT SKELETON HANDS was, unlike literally anything else in this hour of television, pretty shocking. After confessing that he just wanted to hang out with his best friend and fight crime again, Cisco removes the thing that had been keeping Barry from opening a breach back home and tells him he's free to go. Barry, however, has been properly guilted into staying and trying to help out the future, at least a little bit, and, hey! Two villains were conveniently introduced earlier! They’re really lame villains and I don’t actually care about whether or not Barry stops them, but whatever gets this interminable episode over with is fine by me. Barry scoops up the surviving, non-catatonic, non-evil members of Team Flash and deposits them at S.T.A.R. Labs in order to explain that he’s getting the band back together. (This moment really shows the lack of female Team Flash members, by the way.) When everyone has agreed to help out, Barry goes after Top and Mirror Master and... immediately gets vertigo and Rubber Building Vision (I think the show’s visual effects people were inspired by the Doctor Strange movie) so he’s incapacitated immediately. But then Future Barry shows up at S.T.A.R. Labs wearing a shiny new suit and he offers to run a device that counteracts the Top/Mirror Master powers to Present Barry. Because of course this episode is going to end with the Future Team Flash getting back together. If you ran the data of this episode through a computer designed to spit out the most cliche ending possible, this is what it would spit out. Barry returns to the past and hugs his friends and promises himself that he’ll never, ever let his hair get so weird looking. Or, like, forget to take care of the people around him or something. Whichever. Barry also brought back some device that’s supposed to help him trap Savitar, but it’s so inconsequential during the episode that I forgot about it until just now. Apparently seeing Savitar’s true identity caused Wally’s catatonic state? Yeah, there’s no way this build-up is going to pay off, show. In a perfect display of how inept this episode is, the team promises to get to Caitlin before she pairs up with Savitar and then the scene cuts immediately to Caitlin pairing up with Savitar.